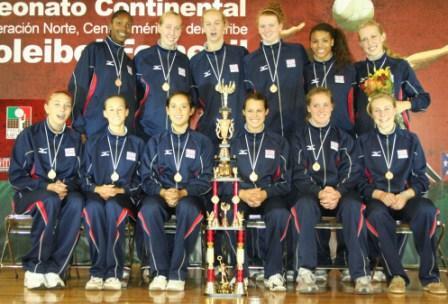 SALTILLO, Coahuila, July 27, 2008.- The team of United States confirmed its class and the crown by defeating the Dominican Republic in three sets in the gold medal match of the NORCECA Women’s Junior Volleyball Tournament. The Americans won 25-21, 25-20, 25-18 and convinced that the loss suffered to the same Dominicans (3-1) in the first day was precisely a surprise, since starting from there they began an ascent that never stopped until the highest point of the podium. The best scorer for the monarchs was Gina Mancuso (13, followed by Michelle Bartsch (12) and Darcy Dorton (10). Dominican Jeoselyna Rodriguez (14) was the best scorer of her team and the match. As it was in the continental championship of this category in 2006 in Monterrey, the Americans and Dominicans disputed the title, even though they went into five sets on that occasion.